Based on observations and some very valuable comments by folks at my first ever Sketchnoting 102 workshop, I am changing the approach somewhat, moving into the actual Sketchnoting more gently. One workshop participant suggested that the first Sketchnoting exercise be a song or something that people were already familiar with. Eleanor Rigby comes to mind. But I used the 3 Little Pigs story and will likely do that at the short teaser workshop in September at Firecat Studios in San Antonio. If you’re coming to that, don’t tell. 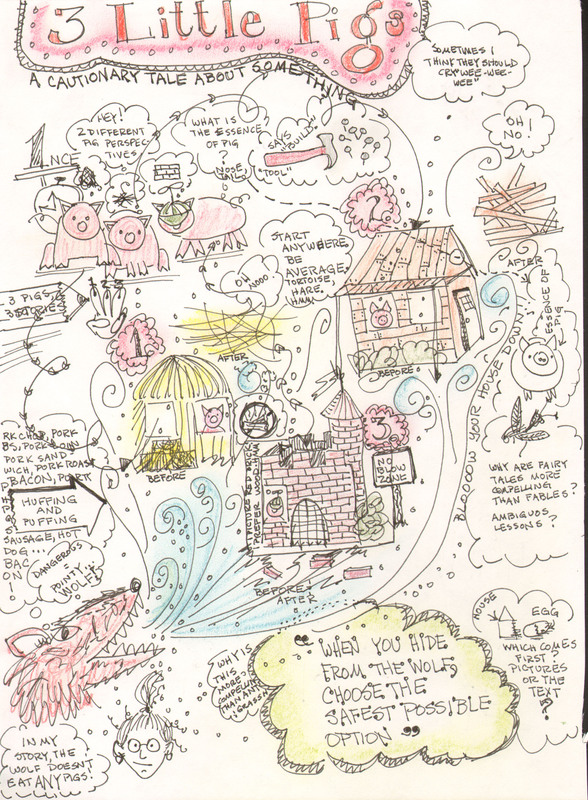 Here’s the Sketchnote illustration that I came up with. And while I was drawing and thinking, I came up with my idea of the essence of pig. See if you can find it. Each time I draw I add at least one other symbol to my Sketchnote vocabulary. Why don’t you try it? Or work on Eleanor Rigby? Or this one? Just don’t watch. Listen only. What can you draw today? What else could this be besides ideas out of the box? 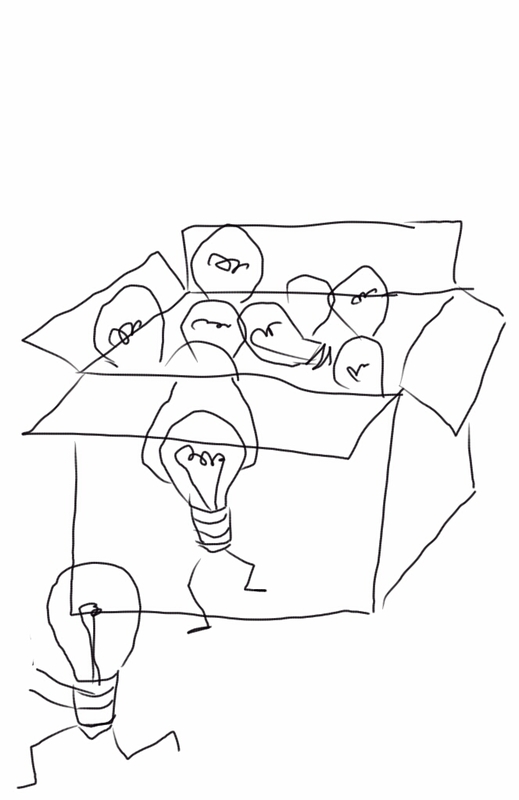 What if you had to draw an actual idea out of the box? What might that look like? Animal bodies are harder for me to draw than animal heads but sometimes you need the body. Like if I wanted to show steady transport of some object, I might need to put it on a camel to move it across my page. Camels’ nostrils are slits, again to keep out the sand. I forgot those on yesterday’s head. You should add them. And then there’s the deal of the knees on the back legs going backward. Well, they don’t really but there’s an odd bend in the thigh to place the leg underneath the body. Bodies have three sections more the most part, the shoulder, the belly and the rear. I draw them first as three circles with the belly the big circle. 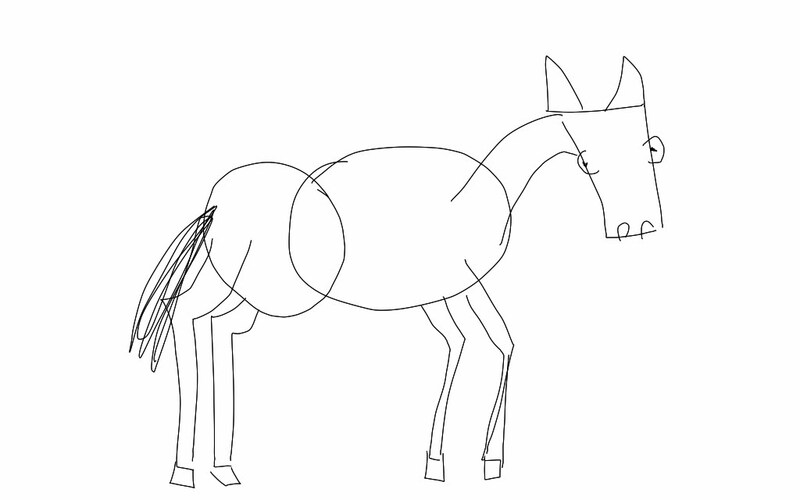 You can see that in this horse drawing I only used two. That works too. The more familiar I am with the object, the less I use the drawn circles and the more I just imagine them when I draw the outside line. Now I’m working to get this to an icon state. That seems even harder. 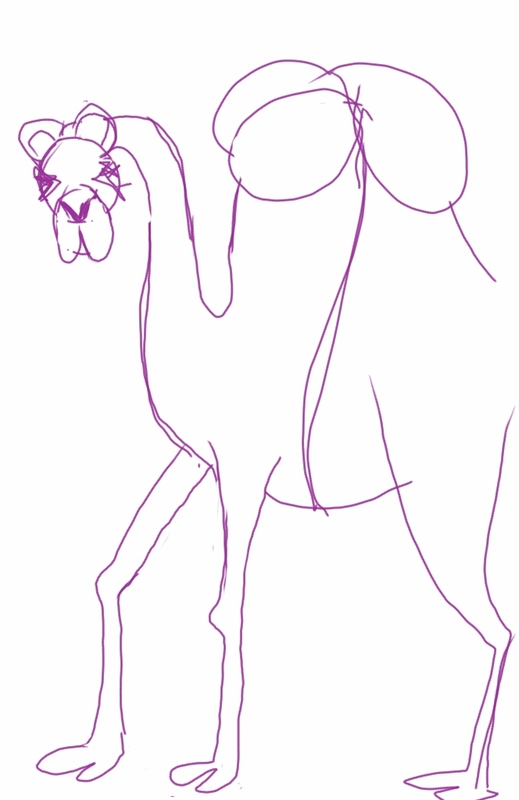 Draw a camel today crossing a desert carrying something important. They do that, you know. Sometimes I develop visual metaphors simply because I want to draw those images. Like this camel face. Once I learn it, I can use a camel to stand for many things . . . going long distances. . . carrying burdens. . . trekking through unknown territories, etc. and buck teeth just for fun. Camel. What else could it stand for? A BIG thank you to all you Sketchnoters!!! Thank you, thank you to all you Sketchnoters who came to the class Saturday and helped refine it. I learned a lot! Here’s my original class map. All the components are there but with your feedback, we moved some stuff around. See if this seems familiar and if you can follow it. Here’s the current facilitator guide which includes the lectures and the beginning principles. It will change based on your very valuable input, but for now you can use it to keep going. The wide margins are for you to draw in. Read through the transcript to get an idea of the subject and the points covered. See if you can determine a structure that underlies the entire talk. Print out the transcript. Use a pen to highlight the main points. Pull them out from the details. Think about what image conveys the idea of each point to you. Maybe even sketch a few. Pick one pen. Leave any other colors or lines alone for now. Play the podcast and try to Sketchnote it. Do it all in one go. Leave room around your images so that you can go back and add points in if you missed something important. Remember, you’re capturing what’s important to you, not the entire talk. Go back and re-illustrate. Look for relationships and call them out on your page. Frame groups of ideas with fancy frames. You can also add color at this point. Another outcome from the class. I have created a shared album in Picasa that we can use to build our Symbollary. I have scanned the “fussy” images and added the ones that I created for the facilitator guide. I have also tagged a few. You can upload too. Make sure that you tag your images. Here’s a concept to draw for the day. There are three conditions that foster insight: preparation, incubation and the off-conscious state that usually accompanies an intuitive leap. . . Most creative people know the value of putting their work aside and turning to something else for awhile. 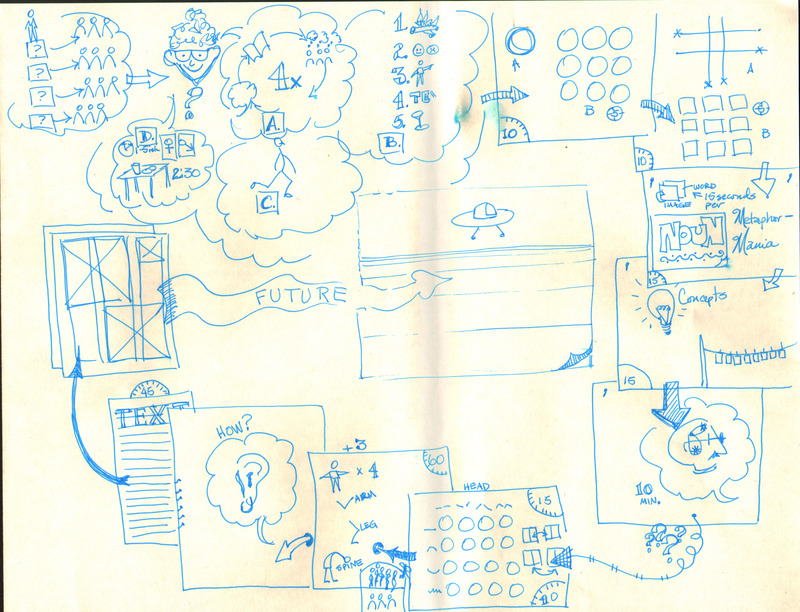 Or, the next stage of Sketchnoting — shared visual thinking. One of you said at the end of the class that you could see using Sketchnoting in shared project scoping. BRILLIANT! 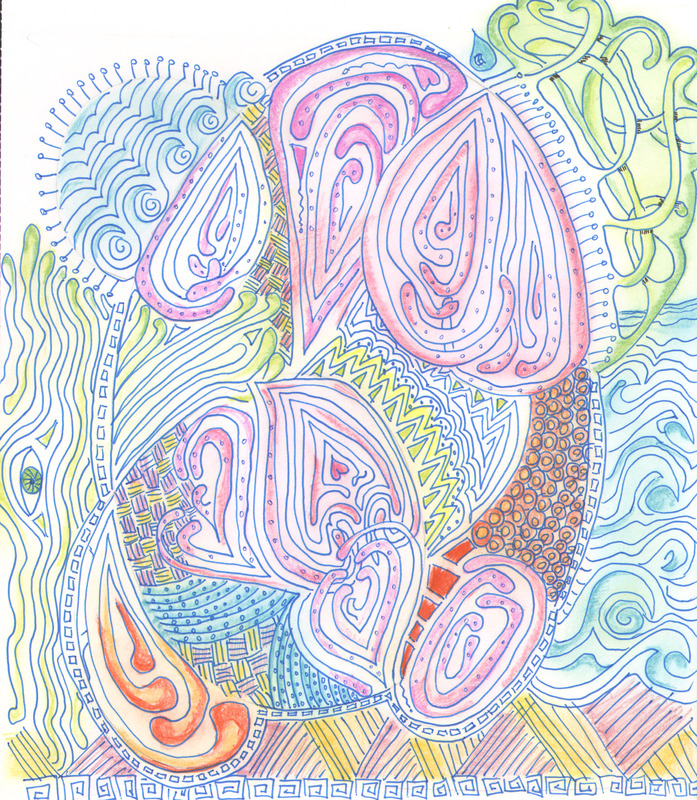 I read about this drawing exercise called Zentangle. It reminded me of doodles from the late 60s. I started out Zentangling and then the pen took over. I lost about an hour in very happy drawing, using no talent and no energy. I think I’ll do it again. Remember me talking about the song Jambo, Bwana being sung everywhere there were tourists in Kenya? Here are the lyrics so you can sing along to the chorus. And here’s a link to the song. Here are some Kiswahili words I learned in Kenya. They seemed much easier to remember than the Ahmaric words I tried to learn in Ethiopia. The most important word to know is Salaam, which means peace and is a standard Arabic greeting. And it works in Ethiopia as well. 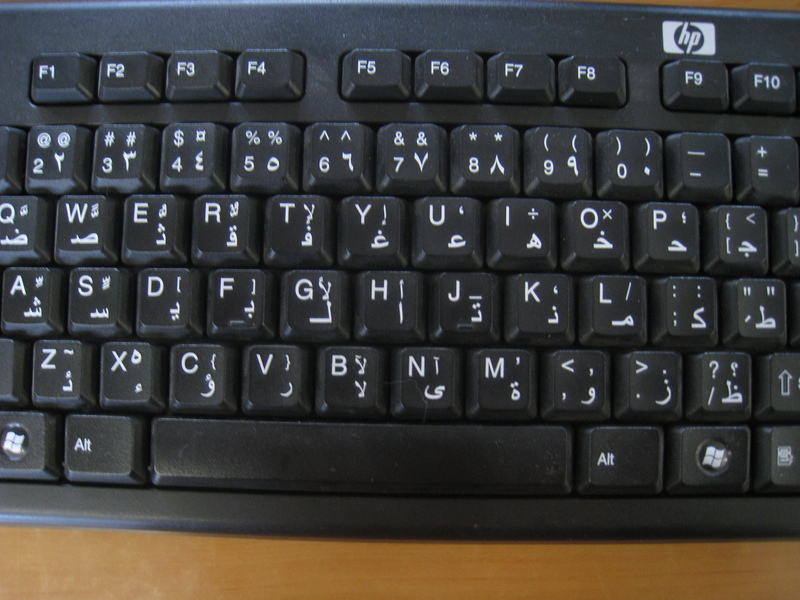 See the Ahmaric characters on the computer keyboard? Okay, here are the ones that it’s important for everyone to know so we teach them first to children. So our guides taught them to us. Karibu — You’re welcome. To make these “bigger,” add Sana, which is used like very. 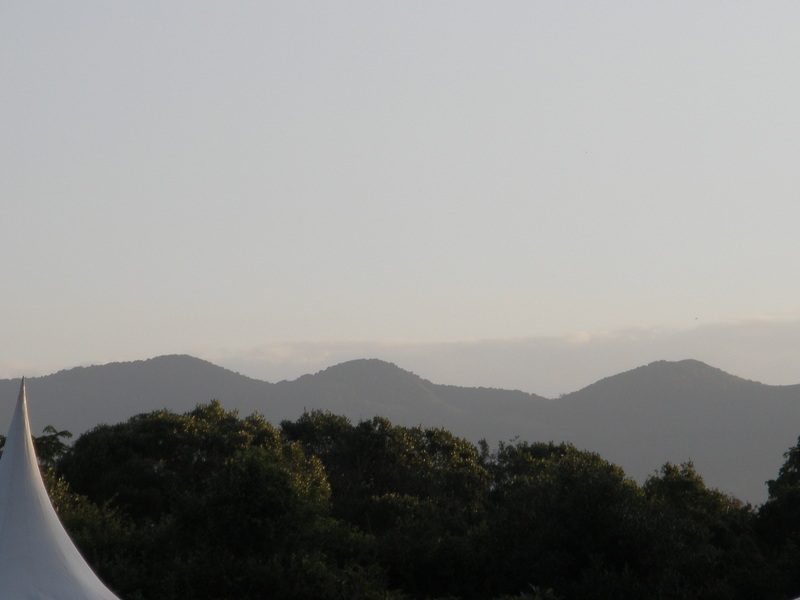 Jambo — Hello. My Jambo must have gotten so good that one day when I used it at the hotel, I had to stop the flood of Kiswahili that followed. Harambe — working together, which people use when they have to push a car out of an intersection and everyone has to push together. Matatu — a very crowded, radically driven mini-bus used for transportation. Kenya’s say that it’s not a coincidence that their name is so close to the Kiswahili word for problem, matata. Mix and let sit for an hour in fridge for flavor to develop. I counted on the ginger to add the heat, but next time I might add some chopped chili as well. Today for lunch, 2 c. of leftovers with juice whirled in the blender with 1/2 heirloom tomato. Shoulda taken pictures. Oh wait! No camera. Sigh.